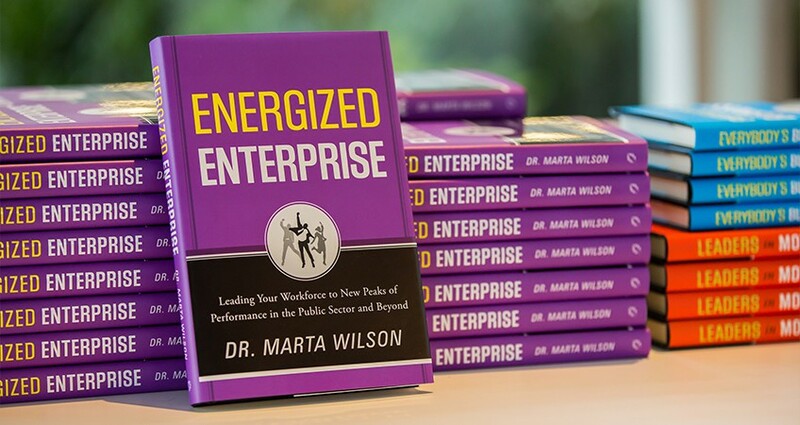 Energized Enterprise by TSI CEO, Marta Wilson, available online and in bookstores - Transformation Systems, Inc. Transformation Systems. Inc. CEO,Dr.Marta Wilson, has released anew book,ENERGIZED ENTERPRISE: Leading Your Workforce to New Peaks of Performance in the Public Sector and Beyond(Greenleaf Book Group Press; Hardcover; September 15, 2015).Wilson gives public and private sector leaders the formula to advance to the leading edge while lifting their workforce to new heights. Wilson says that the key to a successful enterprise is having an empowered and energized workforce which blossoms directly from effective leadership and management.And she provides a tool chest to do just that— fix the challenges leader face in becoming great, effective leaders. Dr. Wilson provides specific steps to improve effectiveness by putting the human element and the total enterprise at the forefront of a leader’s strategy and daily actions. She offers fundamental principles of effective leadership, seven key leadership rules, as well as research,stories and practical examples. Each chapter leaves the reader with food for thought in the form of questions for reflection, discussion and action. These questions allow the reader to take a look inside their enterprise and develop strategies that make them more effective, leaving leaders at the helm of a more energized workforce that is motivated, engaged, and wants to make a big difference. TSI is a fast growth management systems engineering company of PhDs, possibility thinkers and business authors who help forward thinking military and civilian leaders within the Defense community achieve their extremely challenging goals in ways that are most efficient, effective and responsive.The TSI team has been recognized repeatedly for helping set historic records as part of the Defense community’s counter-IED effort within the Joint MRAP Vehicle Program and by the Naval Sea Systems Command for facilitating successful technology transitions such as ERP. When leaders must improve enterprise performance without increasing their budgets, they call TSI for management systems engineering solutions that increase productivity and save money.